We accept Visa, MasterCard, American Express, & Discover Credit Cards as well as PayPal. 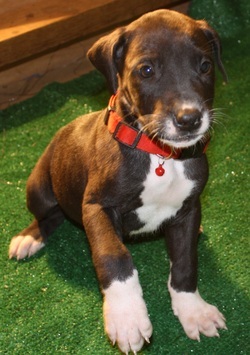 Puppy 1: Sadie - Mantle Female SOLD!!! 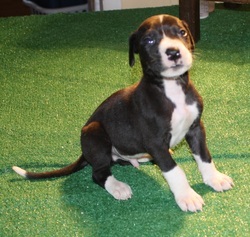 Puppy 2: Socks - Mantle Male SOLD!!! 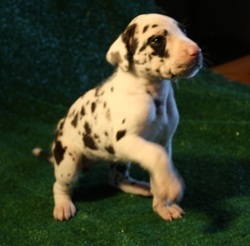 Puppy 3: Amora - Harlequin Female SOLD!! 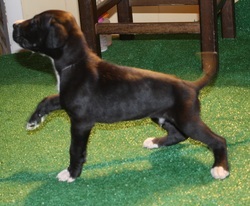 Puppy 4: Bob - Mantle Male - SOLD!!!! Named by my son because he thought it was a cool name. 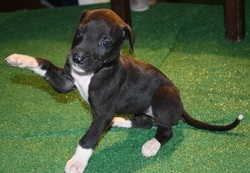 Puppy 5: Charly - Mantle Female- SOLD!!! Charly is playful but not overly playful. She likes to hang out with my children and cuddle up and go to sleep while the kids watch a movie. She's had two sets of 5-Way vaccines; Bordatella vaccine; 5 Day regimen of Albon for coxcitiosis; has been preventatively de-wormed three-times. She's healthy and fat and ready to go to her new permanent family. 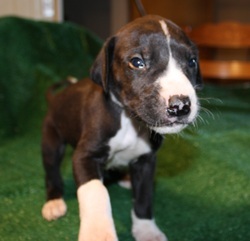 Puppy 6: Scamper - Mantle Male SOLD!! !